A short, 3 mile loop in the Hollywood Hills. 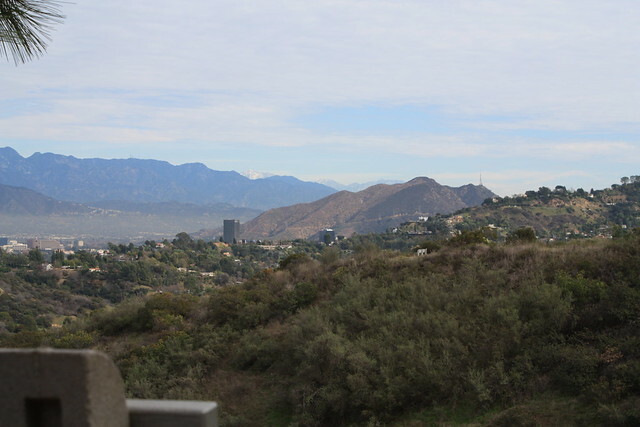 Centrally located with easy access from Hollywood and Studio City, this is a slightly easier but nicer alternative to other popular Hollywood hikes like Runyon Canyon. 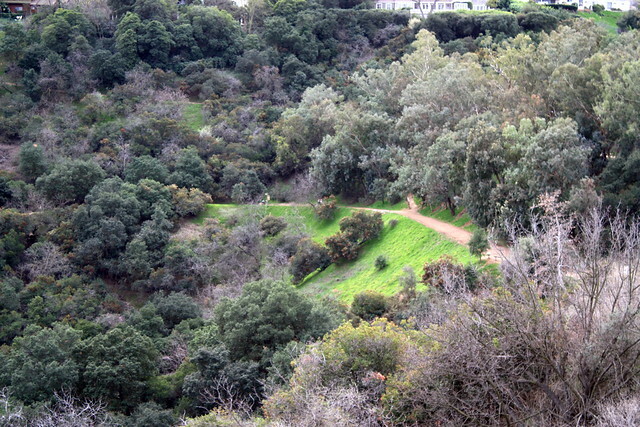 Fryman Canyon has fire road or trail paths, plenty of spur trails to vista points and benches, and access to the TreePeople‘s Coldwater Canyon pavilion. While it is an urban trail, it doesn’t seem crowded on the trail. And while it’s dog friendly, it doesn’t have the pile-of-poop problem that Runyon has. Definitely worth checking out. My friend Blair had been trying to get me out to Fryman Canyon for a while, singing its praises as being “Just Like Runyon, Without The Runyon.” So, on a long weekend, I finally took her up on the offer and trekked all the way out to the strange and distant land known as Studio City. Yes, just a quick drive over the Hollywood Hills and we were at the trailhead just off Laurel Canyon Blvd. 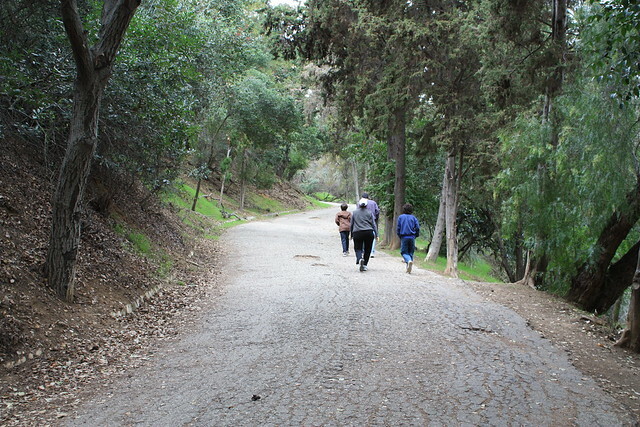 – a small and packed-to-the-brim parking lot, full of hikers, joggers, and dogs. While we did have to wait a few minutes for parking, I was assured that the turnover for the lot isn’t that bad, and you can usually find a spot within a short wait, even if the lot’s full. 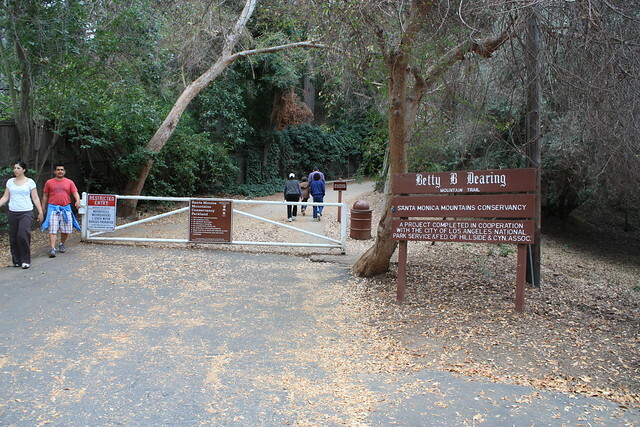 While this is commonly known as Fryman Canyon, the park is labeled “Wilacre Park” on other maps, and the trail sign declares it the “Betty B. Dearing Mountain Trail.” Whatever you want to call this area, the hike on the paved portion of this trail only last for about 0.3 miles, giving way to a dirt road. 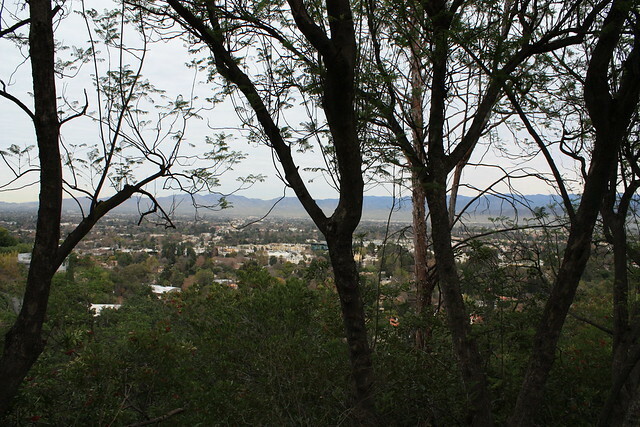 But even the paved portion is a nice walk — well shaded and occasionally offering some nice views of the Valley cities. While this is not a difficult stretch of trail by any means, there is a gradual but noticeable elevation gain. In the first half mile, you’ll gain about 270 feet — after that, the trail hits a sort of straightaway, slowly trudging up an easy gain. You will also begin to notice a few side-trails climbing sharply to the south, away from the fire road. While these trails are not marked on any maps of the park, they lead to a rough system of use-trails that generally parallel the fire road. So if the crowds are getting to you, you can take a quick escape along one of these many optional routes. At 0.6 miles, you’ll pass the first of several memorial benches, placed in scenic areas and shady spots along the trail. 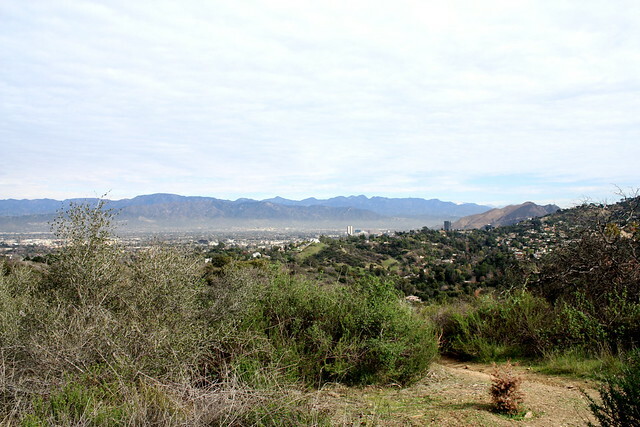 If you keep moving, the trail continues to the southwest, then loops around a ridge and turns toward Coldwater Canyon Park. At the 1.3 mile mark, you’ll get a nice view of the the end of the canyon, and the side trails up into Coldwater. 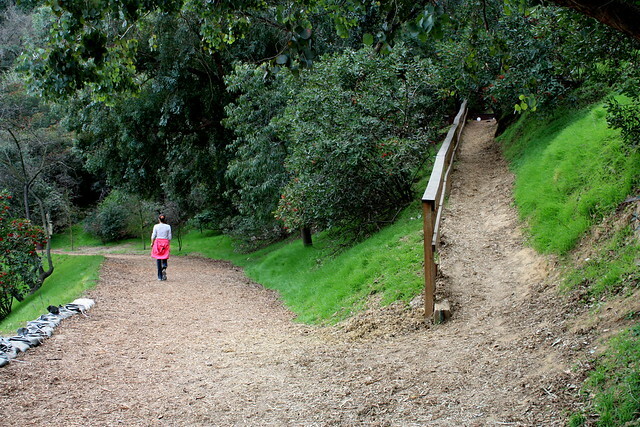 Continue just a few hundred feet more to the junction with Coldwater Canyon Park. This is the very north end of the sprawling park unit, which stretches through Franklin Canyon all the way to Beverly Drive in Beverly Hills. It is also the home base of the tree-planting volunteer group TreePeople. At about 1.4 miles, you’ll reach a junction where the main road descends into the canyon, and a side trail rises up out of it. Take the side trail. 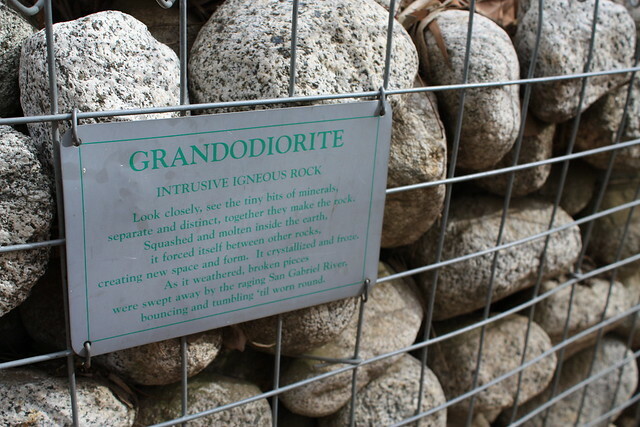 You’ll climb a small incline and pass a built-in exhibit about the various types of rocks that make up the Santa Monica Mountains. Get your learn on, or keep walking. At about 1.5 miles, you will come to another trail that continues climbing up the ridge. But before you continue, you can also take a few minutes off and explore the TreePeople’s new Center for Community Forestry, which will be right behind you. There’s a tree nursery, an interesting urban runoff garden, some great landscaping, and an amphitheater which hosts occasional educational programs for students and the public. When you’re done poking around, head back up that trail, near the rock-exhibit stairs. This leads to a side trail that parallels the main fire road, but – from what I’m told – is usually pretty devoid of hikers. It will also give you some nice vantage points on the rest of the canyon, including some views of the trails you’ve already hiked to get here. Continue on this trail until about the 1.7 mile mark, where you’ll come upon a secluded picnic area and a bench looking toward the San Gabriel Mountains to the east. If you’re lucky and hike this on a clear day, you may even be able to make out some distant snow-caps (I was barely able to spot a few, myself). But more often than not, you’ll probably just get Universal City, Cahuenga Peak, and Griffith Park. This is the end of the trail, or so it would seem. If you don’t feel like backtracking on the fire road (and maybe have been itching for a more challenging trail), instead continue walking just past the benches. You’ll see a faint but clear path emerge between the brush, which eventually becomes a very steep use-trail back down to the fire road. It’s a very short trail, but it’s overgrown, rocky, and the final section is very, very steep. 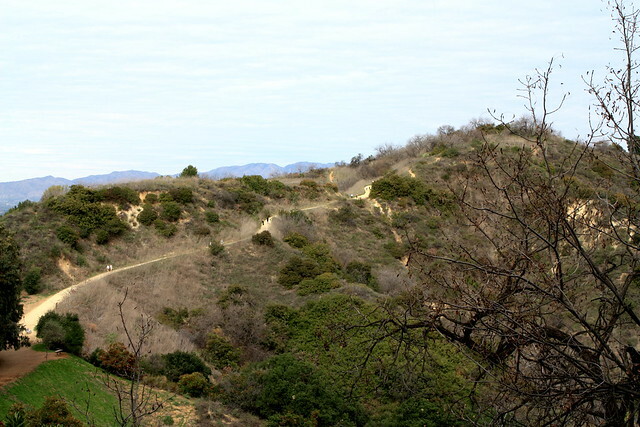 It’s not really anything like what’s on the rest of the fire road, so if you’re not used to that sort of hiking, I’d recommend just doubling back and rejoining the fire road near the Coldwater Canyon marker. Once you hit the dirt road again, continue heading east. Here, the trail begins to press up against the private landowners in the hills, and the north side of the trail gets fenced off. It’s not the most pleasant thing to look at, but the overall trail condition is still fairly nice. At 2.1 miles, the trail spills out onto a cul-de-sac at the end of Iredell Lane. A few hundred feet down the road, on the south side of the street, there is a fire road that climbs back up the ridge from the street. 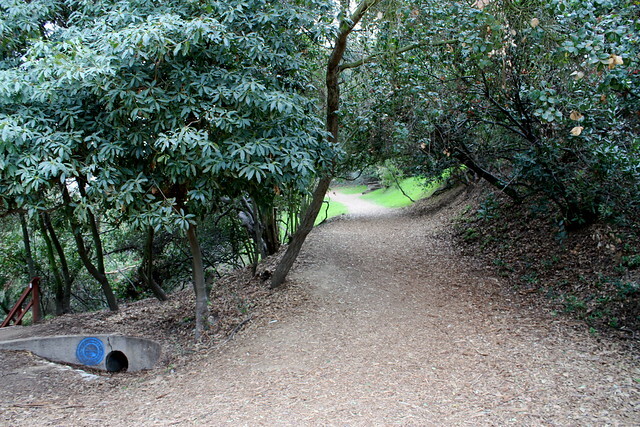 This is the entrance to the “Rainforest Trail,” a winding single-track trail that meanders through some of the non-developed areas in the Hollywood Hills. I didn’t know much about it when we were there, otherwise I would have explored more — but the LAist checked out some of the scenery a few years back. Unless you choose to explore the Rainforest Trail, continue on the road for another 0.2 miles, taking a right at Iredell Street and then a left onto Fryman Road to return to the parking area. Even though this is a residential area, it’s still a pleasant downhill stroll. And most likely, you’ll still be surrounded by hikers from the canyon. Even the Google Street View Van couldn’t escape ’em. 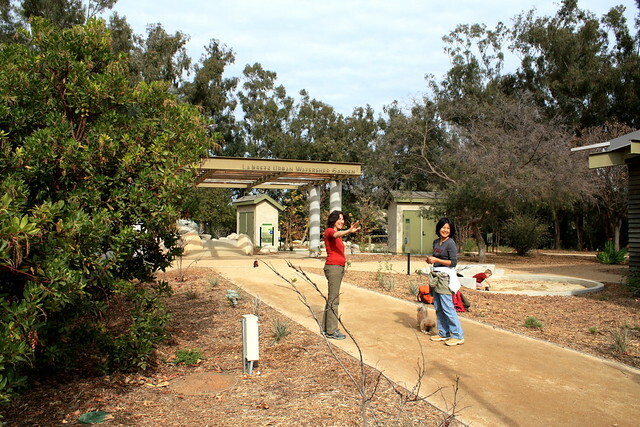 In January of 2018, Wilacre Park re-opened after months of renovations, including new improvements to the trailhead and a re-paving of parts of the lower trail. An eyesore-ish chain link fence was removed as well — and the views are still great! Excellent. Well-maintained fire road for the majority of the trail, with clear signs and landmarks. The use-trails that parallel the fire road are not marked or maintained, but are heavily traveled and easy to spot. From the Valley, head south on Laurel Canyon Blvd. from Studio City. 0.8 miles south of Ventura Blvd., turn right onto Fryman Road. The parking area is immediately visible. From the south, at Laurel Canyon (Crescent Heights) and Sunset in West Hollywood, head north on Laurel Canyon for 3.5 miles. 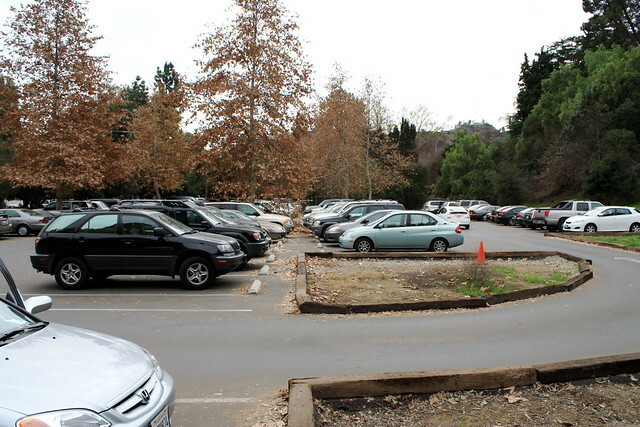 Take a left onto Fryman Road and park in the lot. There was previously a fee to park here but as of 2015, parking is free. Transit accessible via Metro bus 218. It's actually 2.60 mile loop according to my GPS. A lot shorter than I had originally thought. Now that flush toilets are at this trailhead, the lot is mobbed compared to before when it was just a hut. Would this be a good hike after a storm ? I checked out the post-rain hikes, but I stumbled upon this and am very interested. There's free parking at TreePeople's site, at the north fork of Coldwater & Mulholland. My experiences with Fryman Canyon pre-date the development of the managed trail system that exists today. As a teenager growing up in LA in the '60's an '70's, I and my friends would spend the night walking (and sometimes running) the trails that ran between Coldwater and Laurel Canyons, below Mulholland Drive. We would enhance our experience with some psychedelic, widely available then. There is nothing like watching the lights of the Valley from the large conglomerate rock a short ways off the fire road, particularly the searchlights that were much more common those days, creating beautiful trails over the shimmering snake-like freeway. Alas, those days are gone. It's unlikely that people are free to do that any more. These were deep spiritual times for me; laugh if you like -- you just don't know. Running like deer through the eucalyptus trees, their leaves on the trail reflecting the full moon light, the deep sense of connectedness, etc. You know if you know. And of course, the Swing Tree. Only a few years before I started coming to the Rain Forest, an agile young man tied a stout rope around a solid branch from this old oak tree that reached out over the small gorge that the natural spring had created. The circumference of the swing was at least 40 feet, making it an exciting ride, using the roots of the oak as a jumping-off point. Our evenings (morning by then) culminated in reaching the pinnacle near Coldwater Cyn, where now a large mansion sits. Here we could see the entire Valley, quite lovely at dawn. We had the great advantage of being alone most of the time. Even during the day, it was rare to see anyone else. Sadly, that is no longer the case. Much beauty has been lost because of good intentions. Please take special care of this place. Those rocks are on a side trail east of the new-ish Taper buildings at Tree People park. Go down that side trail, past the rock display, then you can either walk SE toward Iredell St. or NE to the main part of the trail back to Fryman and Laurel Cyn. hike. She knows I love the out doors and beautiful sunny days. of my sister she handled this like a camp. Nothing like exercise.